put it on his head. Today I read the Biblical accounts (found in the Gospels) of how Jesus spent His last days on this earth. As I compiled a lengthy list, I noticed that, basically, He simply continued to do what He had been doing. He served others by healing them, by teaching them spiritual truths to live by, by answering questions put to Him by His disciples (and by those who didn’t believe He was who He said He was), by preparing them for His departure, and by comforting them with the assurance of His future return and with the promise of the coming of the Holy Spirit who would be their indwelling teacher and comforter. Since He had always done whatever pleased the Father, Jesus needed to make no major changes in His daily practices. However, by the end of the week, He would face His greatest challenge and, thereby, teach the greatest lesson of all: how to obey the Father and to serve Him and others with great love, even though He would suffer--and die--in the process. Is my life so aligned with the Father’s will that I wouldn’t need to dramatically alter what I’m doing if I knew I would die within a week? Can I say, as Jesus did, “I always do the will of the Father,” that I obey my Father at all times--no matter the high cost of obedience? Can I truthfully say to God, what Jesus said in John 17:4, “I have brought You glory on earth by completing the work You gave me to do”? If not, I must begin TODAY to fully align my will with His and to let my daily attitudes and actions be in accordance with His wishes. 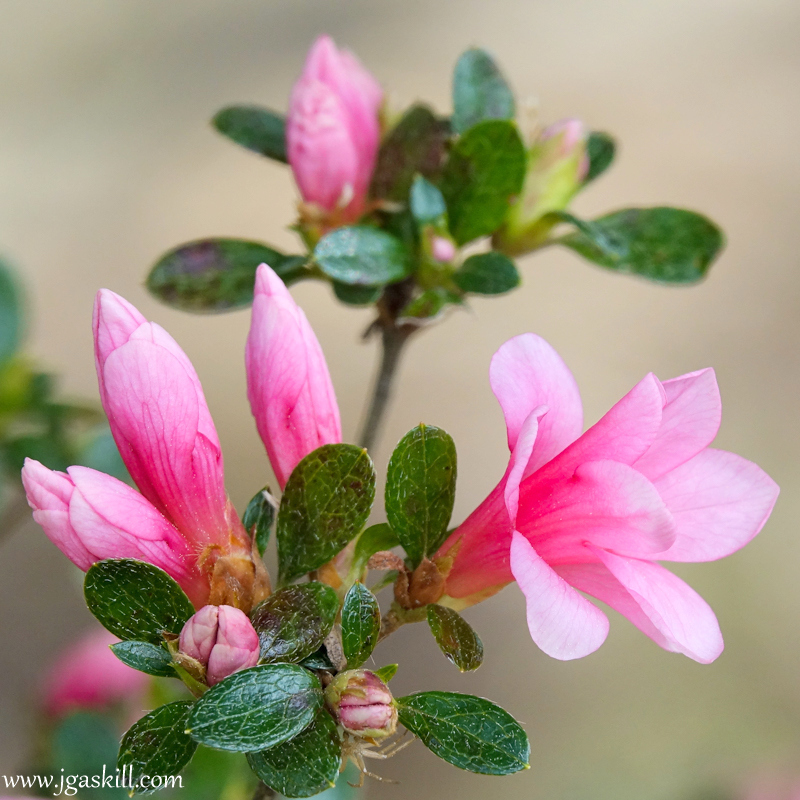 When I photographed these tiny azalea blooms in my yard, I thought, Each stage has its own beauty. Such is true of the stages of human life. May we learn to look for and to appreciate the beauty that's there! May we praise the Creator who put it there. 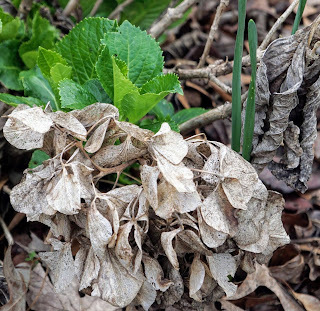 There's an old proverb that says, "No matter how long the winter, spring is sure to follow." That's so true, isn't it? 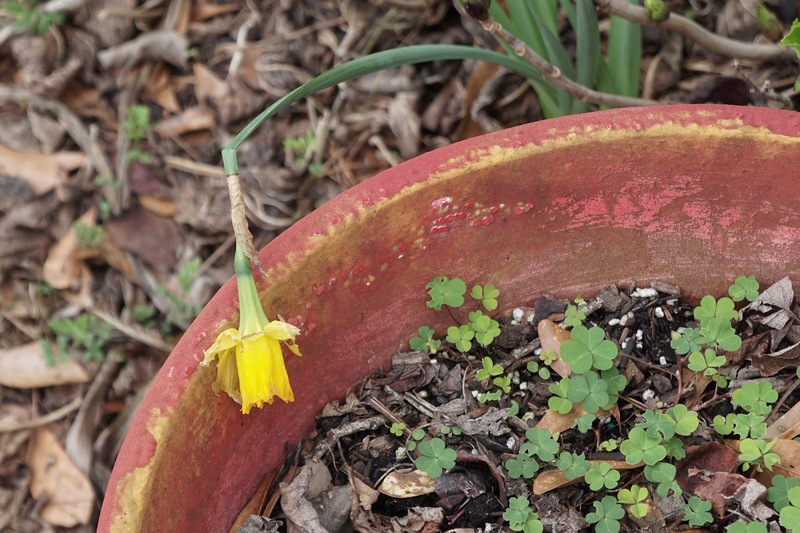 However, when we're in the cold clutches of winter, we tend to think spring will never come. Likewise, we often think that we're stuck forever in a harsh season of life. But, rest assured, a gentler, more beautiful, more hopeful season will surely follow since God designed the seasons--and our lives--to stay on schedule. While reflecting on the cyclical seasons of life, I like to recall the words to Great Is Thy Faithfulness, a favorite hymn of mine, written by Thomas O. Chisholm in the early 1900s. The chorus of the song praises God for His great faithfulness toward us and mentions that daily we see how gracious God is to us and how He so faithfully provides all we need. The verses mention specific ways God demonstrates His faithfulness. For example, even the seasons and the solar system attest to His great faithfulness. God didn't just create the world and all the living creatures that inhabit it and then walk away. No! He faithfully keeps everything (even our lives!) "on schedule"--day after day, year after year. Thus, we learn that we can trust Him to faithfully care for us and to make sure that "No matter how long the winter, spring is sure to follow." Trust Him. Thank Him. Praise Him. I enjoy reading Irish blessings and proverbs, don't you? Below are two I read recently. new hydrangea leaves and daffodils sprouting in the Spring. It's Time for the Dimness to Go! If I love the lyrics found in a song but don't know how to sing it, I read the words as if they were a poem. Currently, I'm memorizing all the verses in Spirit of God, Descend Upon My Heart, which was written by George Croly in 1854. The lyrics read like a prayer. All of the requests are ones I, too, need to make. I reflect on them every morning as I practice saying aloud all four verses. The requests also pop into my mind throughout the day, even when I'm not specifically trying to recall them. 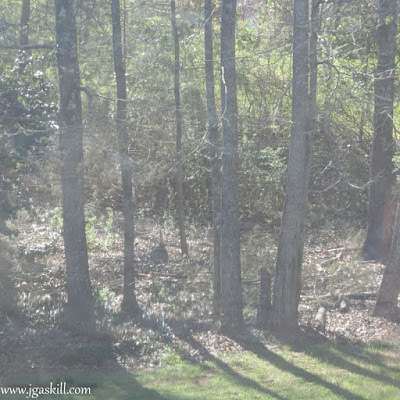 For example, when I sit on the screened-in porch and look through the clear plastic wrap which my husband puts up each Fall and takes down each Spring (to keep the cold air out), I notice how much even those thin sheets of plastic prevent me from clearly seeing all that is in our backyard. The view isn't nearly as pretty as it is when I step out on the deck to enjoy an unobstructed view. Whenever I look through the plastic and notice how "foggy" everything looks, I think about this request found in the song: "...take away the dimness of my soul." And I become even more convinced of the importance of asking God to do that. "Storms" can pop up so quickly in our lives, can't they? One moment, we're sailing along the sea of life and enjoying the journey; the next moment, we're buffeted by savage winds of adversity and practically drowned by a torrent of troubles, sometimes to the point that we wonder if we'll survive the sudden "storm" we never dreamed would come our way. What do we do? The answer is found in a Bible passage (the 8th chapter of Luke, verses 22-25) that contains the story of a strong storm that battered the disciples as they sailed across a lake. When they realized they could go under at any moment, terror gripped them. But they knew what to do. They woke Jesus, who was sleeping peacefully in the boat even while the storm raged. He got up immediately and responded to their cries for help. He spoke to the winds and the water; they calmed down. Observing how quickly He had stilled the storm, the disciples asked one another, in fear and amazement, "Who is this? He commands even the winds and the water, and they obey Him." In other words, "Who is this man in the boat with us?" They knew He was no ordinary man for He possessed powers that no mortal has. Thankfully, He was in the boat with them. He was right there, ready and willing to still the storm and, thereby, save their lives. Dear Reader, that same Jesus is always in the "boat" with us when sudden "storms" come unbidden and unexpected into our lives. If we do what the disciples did and cry out to Him for help, He surely will intervene. Even if He doesn't still the storm immediately, we'll be comforted by knowing He is right there with us and can command calm whenever He chooses to do so. Until then, He stays nearby. And what a comfort His presence is! In Finding Water: The Art of Perseverance, author Julia Cameron writes about the importance of having what she calls “believing mirrors” in our lives. By that she means, trusted friends who encourage us by speaking the truth to us when we're being tempted to believe lies about ourselves. For instance, when we’re bingeing on negative thoughts about ourselves, believing mirrors tell us the truth about ourselves rather than agree with the distorted view we currently have. Believing mirrors see the potential in us. But instead of using flattery to lift our spirits, they speak the truth—in love. Thus, they’re honest, yet never cruel. When we don’t like the “me” we see in our mirror, when all we can see are our flaws, we can turn to these believing mirrors who will help us see a more accurate image of ourselves by pointing out some of our good features. However, the truest mirror is the word of God, which was penned by many truth tellers who lived in centuries past. The words they wrote, under the inspiration of God’s Holy Spirit, are the truest words of all. The more you and I know those truths (like Ephesians 2:10), believe them, and then base our thinking and our actions on them, the more accurate a picture we'll see of ourselves. As more and more truth dwells within us, the more hopeful and confident we become. And...we become better believing mirrors for those who turn to us in search of truth and comfort. While photographing in my yard, I noticed this daffodil that had been damaged by the wind and the rain that had moved through the neighborhood a day or so prior. Oh, it was so beautiful, I thought, but look at it now! As I photographed it, I remembered this quote I'd written in my journal: "There comes a time when the beautiful flower must go. We must let it!" I have no idea who said that, but it's true, isn't it? True not only in regard to beautiful flowers but also true of people, lifestyles, and careers--and sometimes abilites, health, mobility, opportunities, and many other blessings we have enjoyed for years. Naturally, we shrink from letting go, but when we have to, we have to. When that time comes, it's far better to let go gracefully than to do so while "kick'n' and scream'n'," isn't it? As I reflected on the letting go process, I recalled what the psalmist said to God, and my heart echoed his words. O God, do not forsake me.... (Psalm 71:1-18, NKJV). Perhaps, Dear One, you would also like to use these words as a prayer to God and as an affirmation of your continuing faith in Him?